Artist’s impression of New Horizons‘ close encounter with the Pluto–Charon system. New Horizons is an interplanetary space probe that was launched as a part of NASA’s New Frontiers program. Engineered by the Johns Hopkins University Applied Physics Laboratory (APL) and the Southwest Research Institute (SwRI), with a team led by S. Alan Stern, the spacecraft was launched with the primary mission to perform a flyby study of the Pluto system, and a secondary mission to fly by and study one or more other Kuiper belt objects (KBOs). On January 19, 2006, New Horizons was launched from Cape Canaveral Air Force Station directly into an Earth-and-solar escape trajectory with a speed of about 16.26 kilometers per second (58,536 km/h; 36,373 mph). After a brief encounter with asteroid 132524 APL, New Horizons proceeded to Jupiter, making its closest approach on February 28, 2007, at a distance of 2.3 million kilometers (1.4 million miles). The Jupiter flyby provided a gravity assist that increased New Horizons‘ speed; the flyby also enabled a general test of New Horizons‘ scientific capabilities, returning data about the planet’s atmosphere, moons, and magnetosphere. On July 14, 2015, at 11:49 UTC, it flew 12,500 km (7,800 mi) above the surface of Pluto, making it the first spacecraft to explore the dwarf planet. Having completed its flyby of Pluto, New Horizons has maneuvered for a flyby of Kuiper belt object 2014 MU69, expected to take place on January 1, 2019, when it is 43.4 AU from the Sun. The cancellation of Pluto Kuiper Express angered some of the space-exploration scientific community, which led to groups, such as The Planetary Society, lobbying NASA for a reboot of Pluto Kuiper Express or, at the very least, a restart of a mission to Pluto. Internal divisions within NASA, including its Scientific Advisory Council, also voiced support for a Pluto mission. In response to the backlash caused by the cancellation of Pluto Kuiper Express, it was decided to inaugurate a new class of missions that would fit between the big-budget Flagship Program and the low-budget Discovery Program, creating a compromise for missions such as the former Pluto Kuiper Express, which proved to be too expensive for the Discovery Program. A competition was held, in which NASA would select a mission concept to fund as part of the first mission of the New Frontiers program. Stamatios “Tom” Krimigis, head of the Applied Physics Laboratory’s space division, one of many entrants in the New Frontiers Program competition, formed the New Horizons team with Alan Stern in December 2000. Appointed as the project’s principal investigator, Stern was described by Krimigis as “the personification of the Pluto mission”. New Horizons was based largely on Stern’s work since Pluto 350 and involved most of the team from Pluto Kuiper Express. 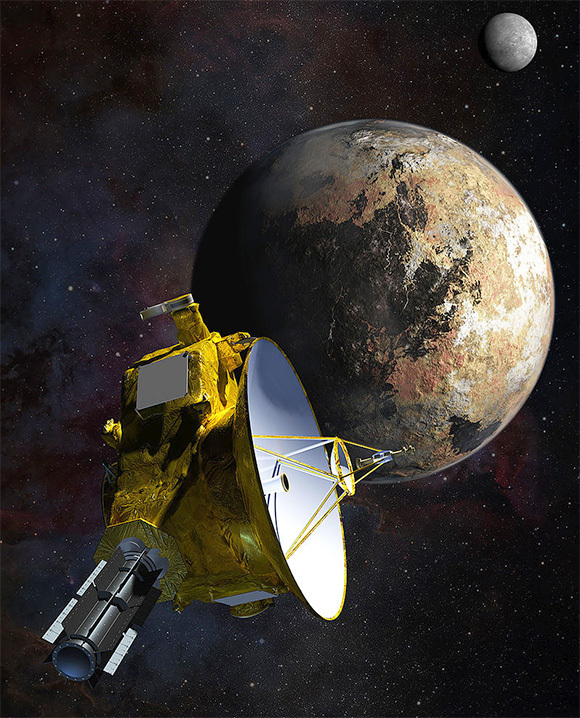 The New Horizons proposal was one of five that were officially submitted to NASA. It was later selected as one of two finalists to be subject to a three-month concept study, in June 2001. The other finalist, POSSE (Pluto and Outer Solar System Explorer), was a separate, but similar Pluto mission concept by the University of Colorado Boulder, led by principal investigator Larry W. Esposito, and supported by the JPL, Lockheed Martin and the University of California. However, the APL, in addition to being supported by Pluto Kuiper Express developers at the Goddard Space Flight Center and Stanford University, were at an advantage; they had recently developed NEAR Shoemaker for NASA, which had successfully entered orbit around 433 Eros earlier in the year, and would later land on the asteroid to scientific and engineering fanfare. In November 2001, New Horizons was officially selected for funding as part of the New Frontiers program. However, the new NASA Administrator appointed by the Bush Administration, Sean O’Keefe, was not supportive of New Horizons, and effectively cancelled it by not including it in NASA’s budget for 2003. NASA’s Associate Administrator for the Science Mission Directorate Ed Weiler prompted Stern to lobby for the funding of New Horizons in hopes of the mission appearing in the Planetary Science Decadal Survey; a prioritized “wish list”, compiled by the United States National Research Council, that reflects the opinions of the scientific community. After an intense campaign to gain support for New Horizons, the Planetary Science Decadal Survey of 2003-2013 was published in the summer of 2002. New Horizons topped the list of projects considered the highest priority among the scientific community in the medium-size category; ahead of missions to the Moon, and even Jupiter. Weiler stated that it was a result that “[his] administration was not going to fight”. Funding for the mission was finally secured following the publication of the report, and Stern’s team were finally able to start building the spacecraft and its instruments, with a planned launch in January 2006 and arrival at Pluto in 2015. New Horizons is the first mission in NASA’s New Frontiers mission category, larger and more expensive than the Discovery missions but smaller than the Flagship Program. The cost of the mission (including spacecraft and instrument development, launch vehicle, mission operations, data analysis, and education/public outreach) is approximately $700 million over 15 years (2001–2016). The spacecraft was built primarily by Southwest Research Institute (SwRI) and the Johns Hopkins Applied Physics Laboratory. The mission’s principal investigator is Alan Stern of the Southwest Research Institute (formerly NASA Associate Administrator). After separation from the launch vehicle, overall control was taken by Mission Operations Center (MOC) at the Applied Physics Laboratory in Howard County, Maryland. The science instruments are operated at Clyde Tombaugh Science Operations Center (T-SOC) in Boulder, Colorado. Navigation is performed at various contractor facilities, whereas the navigational positional data and related celestial reference frames are provided by the Naval Observatory Flagstaff Station through Headquarters NASA and JPL; KinetX is the lead on the New Horizons navigation team and is responsible for planning trajectory adjustments as the spacecraft speeds toward the outer Solar System. Coincidentally the Naval Observatory Flagstaff Station was where the photographic plates were taken for the discovery of Pluto’s moon Charon; and the Naval Observatory is itself not far from the Lowell Observatory where Pluto was discovered. New Horizons was originally planned as a voyage to the only unexplored planet in the Solar System. When the spacecraft was launched, Pluto was still classified as a planet, later to be reclassified as a dwarf planet by the International Astronomical Union (IAU). Some members of the New Horizons team, including Alan Stern, disagree with the IAU definition and still describe Pluto as the ninth planet. Pluto’s satellites Nix and Hydra also have a connection with the spacecraft: the first letters of their names (N and H) are the initials of New Horizons. The moons’ discoverers chose these names for this reason, plus Nix and Hydra’s relationship to the mythological Pluto. In addition to the science equipment, there are several cultural artifacts traveling with the spacecraft. These include a collection of 434,738 names stored on a compact disc, a piece of Scaled Composites’s SpaceShipOne, a “Not Yet Explored” USPS stamp, and a Flag of the United States, along with other mementos. About 30 grams (1 oz) of Clyde Tombaugh’s ashes are aboard the spacecraft, to commemorate his discovery of Pluto in 1930. A Florida-state quarter coin, whose design commemorates human exploration, is included, officially as a trim weight. One of the science packages (a dust counter) is named after Venetia Burney, who, as a child, suggested the name “Pluto” after its discovery. What is Pluto’s atmosphere made of and how does it behave? What does its surface look like? Are there large geological structures? How do solar wind particles interact with Pluto’s atmosphere? NOTE: According to scientists, it is extremely unlikely that there is any intelligent life in our solar system beyond our planet. Looking at the recent ‘New Horizons’ photos of Pluto, where most people see just big pixels, few interpret these artifacts as cities…. 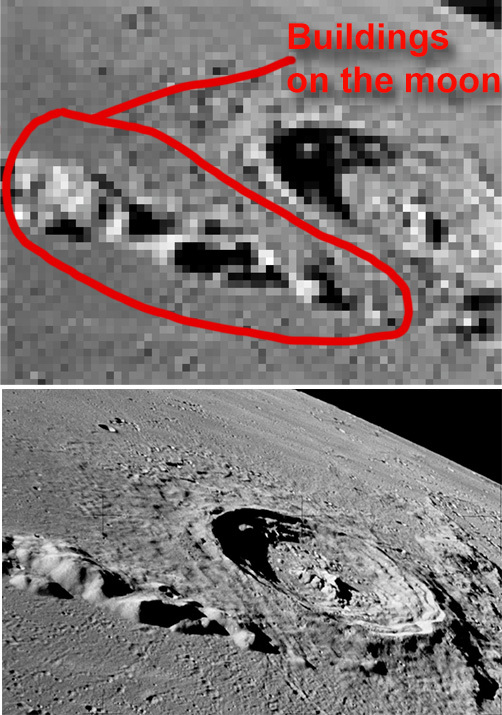 PS Cities on Pluto ? Possibly Pluto and its intricate system of satellites are NOT too cold and too harsh to support Life. Newly NASA-released photos often had contrasts too high for clear resolutions and other methods smudged what would have been sharp pictures. Some photos shown here have been enhanced or cleaned up so quality was restored. 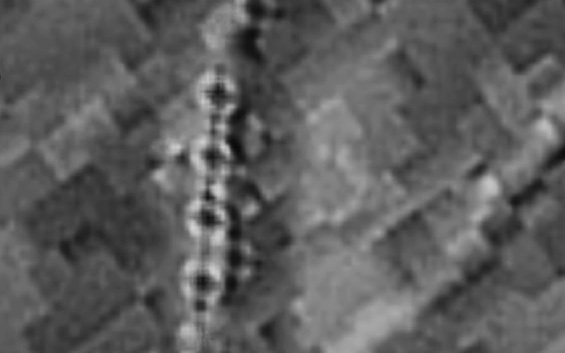 Investigators do not believe we are seeing ancient cities…but, in fact, we are seeing living/breathing human or alien societies on Pluto as well as on other bodies in the Solar System (indicated by patterns of unnatural structures). 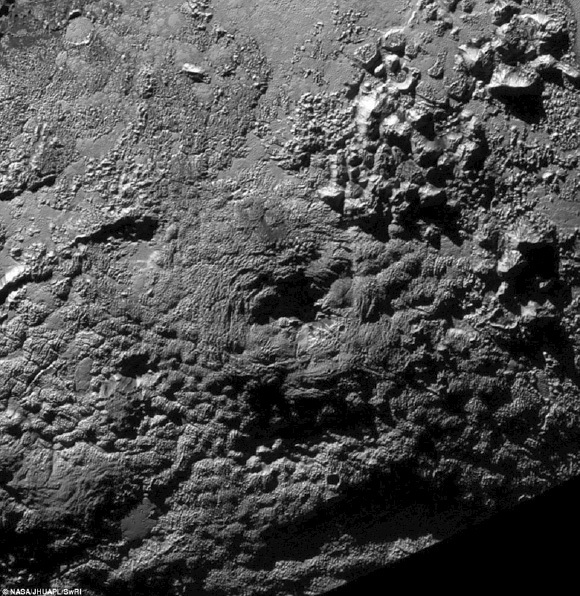 Above is a detail from one particular Plutonian Plain, shown below. An incredible system of grid patterns are revealed once contrast-enhancements are tuned. Photos come to life with patterns very similar to squared and rectangular shapes of Earth’s rural areas or even suburbia seen from high above. 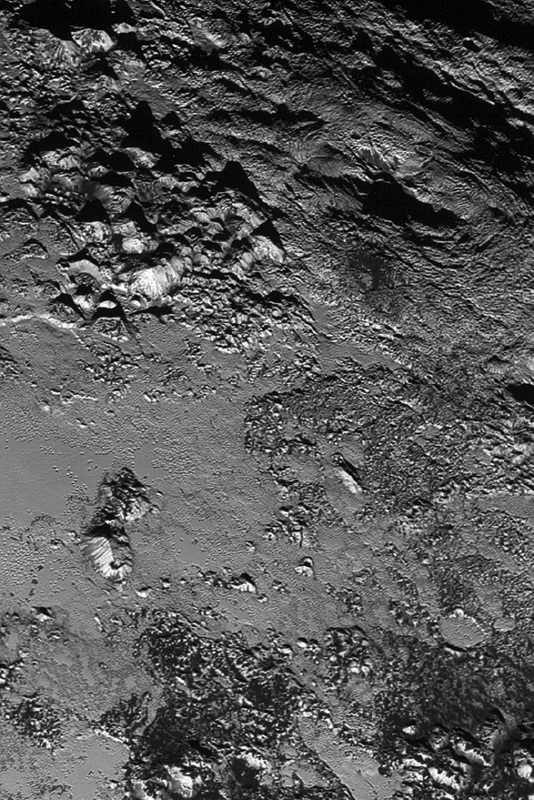 Why wouldn’t unofficial sources call sections of Pluto CITIES? Why aren’t these photos in color? Why is the public always cheated and not shown the good stuff? Why do feds treat us stupidly? Why meter out knowledge and Truth at a snail’s pace when people can handle a whole lot more? Just tell us the whole story! Never, I guess is the answer. Amazing Video! 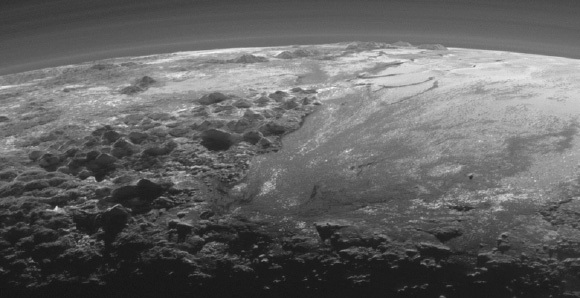 He enhanced a light, hazy, but big CUBICAL section of Pluto – darkened it and let your eyes show you what’s there. You won’t believe them. Try to – this could be exactly what it appears – sharp contrast = CLEAR CITIES: structures, roofs…he called them “platforms” that go thru layers and layers, like parking garages…there is no unification or exact repeat of patterns. There are no smudges or things on edges but things evenly on roofs and platform-like structures. WAIT UNTIL YOU SEE THE SHARP CONTRAST. You’re waiting in the beginning of the clip to all the build-up, then when he switches to dark contrast…your mouth will drop at what you’re seeing! Not a planet, huh? This is not Pixelation – he showed you how to darken and contrast to reveal what was bleached away – this is only the beginning. Why do you think they lie & stop US from going out there? Obviously the presented evidence about Pluto and others?Gives assurances that creative forces have been at play for sometime now.The truth allows Victory of our solar system,and forensics involved at the sub-atomic-levels for support of life as we know the cause but yet study the effect.Suspect the central galactic field held in spiral form like many particles travels on photons of pure creative patterns.Records show ancients timed at millions Plus billions of precessions as time measured upon radiative thermo generators.The float of biological thermal aware thought or Atma source custodianized mysterious authorized report progresses through the vast inter space of being and experienced awareness of self and knowledge. But what would it gain the whole if you lose the foundation of justice and pride? Anyone can see what they want to see. But what if you use the tools the dude in this clip uses and UNDO the masking techniques (that we should be questioning for decades: Moon & Mars)…where we can see what is really there hiding on Pluto?…tools anyone can use. STRUCTURES. Structures are there & it is no one’s imagination: see end of clip. Don’t go by what NASA tells you. Use the eye-test. What do your eyes tell you? My eyes tell me: There may be more cities on Pluto than on Earth? Just a question. Follow the clip. What will be uncovered when more work of others are shared, much later? I mean Honest work. I think it becomes obvious as to why a smear-campaign was unleashed against poor, unsuspecting Pluto and its system of moons. Maybe Honest Investigators have put their finger on why the down-grade of Pluto to a “dwarf.” Think again… We haven’t looked in detail at the planet’s satellites, remember? Can you see buildings on the first picture?